Superior Rents is your solution for Aerial Boom Lifts. Boom lifts are designed to lift personnel in the air for a variety of different industries including: Construction, Industrial, Warehouse/Retail, Government/Military, Aviation, and Entertainment. Our Boom Lifts are available in four wheel drive for all-terrain applications. All are equipped with non-marking cushion tires for inside uses. Superior Rents offers Straight Boom Lifts and Articulating Boom Lifts in diesel and electric powered. These offer greater horizontal outreach than any other type of aerial platform – perfect for areas with limited access in construction and industrial applications. Telescopic booms are also designed for productivity with the traction and drive speed you need to get around the job site and to the work area. Ideal for areas with limited access in construction and industrial applications, minimal tail-swing allows for maneuvering in tight spaces. Dual-fuel (gas or LPG) options available for indoor/outdoor applications. Ideal for outdoor construction and industrial applications are articulating booms that provide lifting versatility with a combination of up, out and over positioning capabilities and outreach that’s second to none. Tight turning radius and zero tail-swing on most models for maneuvering in confined areas. High ground clearance, two or four wheel drive with rough terrain features available. Quiet diesel engine options deliver excellent power, torque, grade-ability and terrain-ability. Full-time positive drive traction system and active oscillating axle (most models) for traction on rough terrain. Self-leveling platform rotates 90° to either side on non-jib models. Jib boom models are available for extra working range. Electric and Bi-Energy machines offer quiet, emission-free operation in the most sensitive work environments. For industrial applications where the machine must be driven significant distances, the Genie bi-energy system combines the benefits of a 48V DC machine with the versatility of a diesel-powered generator. Up, out and over positioning capabilities for ultimate versatility. Tight turning radius and zero tail swing (most models) for easy maneuvering through narrow aisles and standard doors. Proportional lift and drive controls allow precise boom positioning and smooth drive performance. 48V DC electric drive system available for quiet, emission-free operation in sensitive areas. Jib boom models are available for extra working range. Superior Rents currently stocks Genie® Z™-34/22N, Z™-45/25J RT, S™-45-S™-65 and S-85 models. Most Boom Lifts will be delivered to the jobsite (additional fees apply) on a semi-truck. For more information please contact one of our locations to speak to our friendly staff. 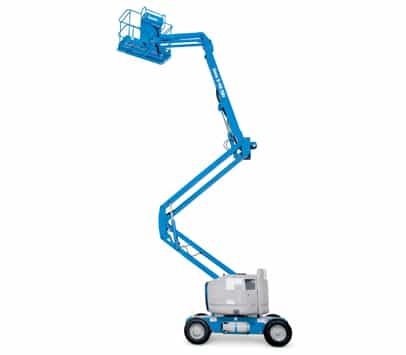 To view more Boom Lift items reference our online catalog here.